Chris Lowther has been appointed Assistant Chief Fire Officer for Community Safety for Tyne and Wear Fire and Rescue Service. Mr Lowther, 41, has worked for the service for 16 years, holding a variety of posts including Area Manager for Service Delivery. 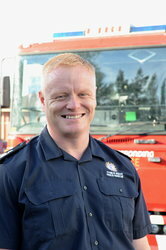 He started his career in 1997 as a Firefighter at Gateshead Fire Station. He then moved to become a Leading Firefighter at Sunderland Central Fire Station before returning to Gateshead to perform the same role there. In 2002, he became an Instructor at the Service's Training Centre in Washington and almost two years later he was promoted to Station Officer at the Service's Headquarters in Pilgrim St, where he was part of a small community safety team. He became Divisional Officer for Community Safety before being appointed District Officer for Gateshead. He then moved to become Divisional Officer, managing the Service's operational services north of the River Tyne. He was promoted to Area Manager for Service Delivery in 2009 and was the first senior officer to be appointed to cover the whole of the Service's Service Delivery (the frontline operational and community safety response) for Tyne and Wear. He was in this post for nearly four years before being promoted to his new role as Assistant Chief Fire Officer for Community Safety. Mr Lowther will be responsible for delivering the service’s frontline emergency response to the public of Tyne and Wear, together with operations and resilience planning, projects to prevent fires from happening through education and promotion of fire safety, ensuring fire safety legislation is complied with and enforced and engagement with a range of communities. Speaking about his promotion Mr Lowther said: “I am honoured and proud to be appointed the Service's Assistant Chief Fire Officer for Community Safety. I firmly believe Tyne and Wear is one of the best fire and rescue services in the country and my priority is to ensure we continue to be so. Whilst we are facing unprecedented challenges our approach will continue to put the safety of our local community, in particular the most vulnerable and the safety of our firefighters first."